We travel light, with only carry-on luggage, but more often now, electronics for travel are almost always tucked into a corner of a suitcase. I'm talking about some of the techie stuff. More and more, you can’t really get around efficiently without some gadget or another. This is hard for us to keep current with because technology changes so quickly. ...when I first wrote this page, the world didn’t even have smart phones! The old cameras and film have gone into the closet to be replaced by digital cameras and smart phones. So do you still need a camera? We do. And sometimes we take both still and video depending on where were going. You phone can take amazing videos now, but there are times it's nice to have a video camera. We loved having one in Madagascar to film the lemurs jumping around in the trees and "dancing" along the ground. It saved room on our phone. If you're taking either, be sure you have enough memory cards. You can probably get additional memory cards anywhere in the world, but they may be expensive. We've been pleasantly surprised where we could get batteries and memory cards... even in the most remote of areas. Where there are tourists, there are people willing to sell them what they need! Do You Need A Laptop Or A Tablet? “We often take a laptop computer now.” That’s another phrase from the past. iPads hadn’t been introduced when we wrote that! It's easier than ever to get connections in hotels and cafes…. or just about anywhere… all over the world! We pretty much only take our iPad and phone anymore. You have to use your judgement on whether to carry your laptop or not... even the smallest of laptops are heavy to carry around. 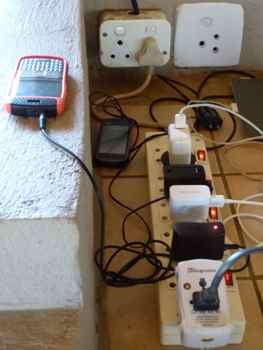 Keeping things charged hasn't been a problem... even in areas like the Pantanal in Brazil, our lodge ran a generator in the evening that charged everything just fine. Same in safari camps in Africa or… well, you get the picture. With any electronics you have to think: Will you need to worry about keeping it safe? Knowing we would have limited internet access, we left it home on that Madagascar trip. Also because we knew the roads would be rough and there would be a lot of dirt. Better not to have to deal with it in that case. We did take the laptop to Hungary and used it on the hydrofoil to Slovakia. Sometimes I like writing these stories on the road… sometimes not! Your mobile phone may take some planning. Different formats are used in the U.S. and the rest of the world. If you have an American cell phone that will work overseas, those minutes may be expensive. It might be worth your while to buy an inexpensive phone on arrival. If you did opt to take your laptop, there is always VoIP like Skype and Google Talk, and new developments all the time. If you take a smart phone like the iPhone, you want to be careful about the roaming charges. You might want to disable the data-roaming feature, keep the phone is airplane mode, and check your e-mail at public WiFi spots to save money. I actually use a plan that does not charge for roaming in most places, and it works in most countries of the world. Shop around for what will work for you. —and it was in their native language, not English. Our phone works just fine for most of our purposes. Where it doesn't, we still prefer road maps ourselves, but there are good arguments for including a GPS as one of the electronics for travel. Remember to take all the appropriate adaptor plugs so you can keep everything charged. No use to have electronics for travel if you can't plug them in! 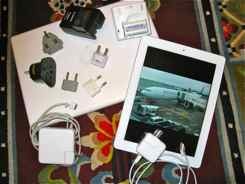 Weigh the advantages and disadvantages for your trip, but we think you'll find that you too will be carrying more electronics for travel.